With three growing boys, it feels like I am always buying new shoes. I’ve learned that if I’m going to keep their feet in shoes that fit and still be able to afford to eat, I have to resist buying myself new shoes as often as I might like. I’m becoming a pro at making shoes last longer. I’ve found that with just a little bit of maintenance and fix-it know-how, I’ve been able to make my shoes last for years. That means more money saved and less shoe waste in landfills. Buy the best quality shoes you can afford. If you start with cheap, poorly made shoes, there’s not a lot you can do to extend their life. (Believe me, I’ve tried.) So start with the best quality shoes you can afford. Buy classic colors and styles so that they can survive changes in fashion trends. Look closely at how the shoes are constructed, the quality of the seams and stitching, and any laces or fasteners. Price isn’t always an indicator, but sometimes a more expensive pair is more comfortable and durable. There are inexpensive sprays on the market that will help protect your leather shoes, and other types of products that will fight stains on fabric shoes. Check your local shoe store or discount department store for products. It only takes a few minutes and can help make shoes last longer. Cleaning your shoes and keeping them out of snow and water will help them last longer. Periodically take a damp cloth and wipe the dirt off your shoes. When you know you’ll be outside in the outdoor elements consider rain or snow boots that you can change once you’re on dry ground. It costs nothing to keep your shoes clean and can do a lot to make them last. Just putting in new shoe laces can give your old shoes a fresh look. It can even make them feel better, too. Get some shoe polish and shine up those shoes. It only takes a few minutes to do and they’ll look brand new when you’re done. I’ve had good experiences with the Kiwi shoe polishing products , and make sure I always have brown and black polish on hand. It’s an inexpensive fix and the stuff lasts a long time if stored properly. Check out the condition of the toes in the “before” picture! You can really see how the shoe polish brought these shoes back to life. My kids are notoriously hard on shoes. It’s quite common for a bit of the rubber sole to peel back from the toes of their shoes. 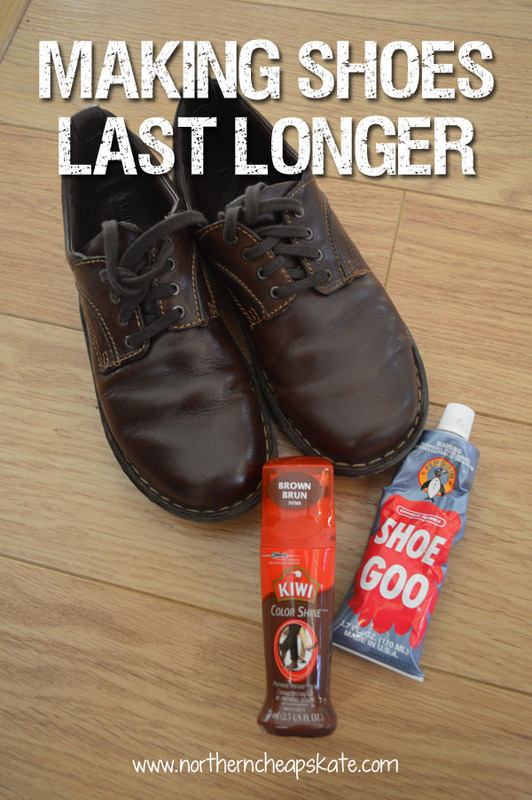 We’ve been making shoes last longer by using a great product called Shoe Goo . It’s a super strong, clear adhesive you can use to make those shoes wearable again. You can also try finding a shoe repair shop in your local area. Many times you can get a shoe completely re-soled or repaired for a fraction of the price of new. If shining and cleaning aren’t enough to extend the life of your shoes, consider giving them a whole new look. Jessica at Save Green Being Green added some glitter to spruce up a pair of dress shoes. A well-placed fabric notion or fabric paint may be just the thing to give new life to your old shoes. Certain brands of shoes actually come with a warranty, so if your shoes seem to be falling apart prematurely, it’s worth seeing if the manufacturer can repair them. A friend of mine recently sent in Doc Martens for repair and because they couldn’t fix them, they sent him a brand new pair of shoes. Sometimes a good pair of shoes still looks great, but starts to lose some of their comfort. You can improve your old shoes with simple shoe inserts you can get at any discount department store or online. For under $10 you can have more comfortable insoles and you may be able to get another year out of your shoes. If you just can’t seem to make your old shoes look and feel better, then it’s time to get rid of them. Before tossing them in the trash, consider recycling them through places Nike’s Reuse-A-Shoe program or if they still have a little life left, donate them to a local charity or to TerraCycle’s Shoe Donation program. The bottom line is this: Buy the best footwear you can afford and take care of it. Quality footwear that’s well-maintained fits better, looks better, and lasts longer. That reminds me, it’s time to give my work shoes a good polish! It’s also best to rotate shoes. Footwear needs time to dry out from all of our gross feet moisture. If you alternate between two pairs of shoes, they’ll last significantly longer than if you wore one every day, tossed them when they were dead and wear out the next set. I actually have two pairs of the exact same shoes because I just wasn’t wearing my other ones much. So now I just make sure I wear a different pair each day — assuming I leave the house that day, of course. That’s an excellent point! I don’t always think about it because feet don’t sweat much in MInnesota… except for the two hot weeks in August. But it’s a good one. Shoes need to “breathe” too.